Graphing, Surveys, and Data Collection pack is aligned to 1.MD.C.4, 2.MD.D.10, and 3.MD.B.3. 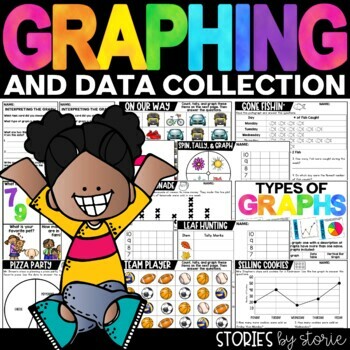 This pack includes many activities and worksheets for graphing and data collection. This pack is 110+ pages (answer keys included where appropriate). Take a look at the preview to get a closer look at all of the included pages. Students can survey their classmates and graph the results. There are 30 survey cards and 4 graphing templates included. 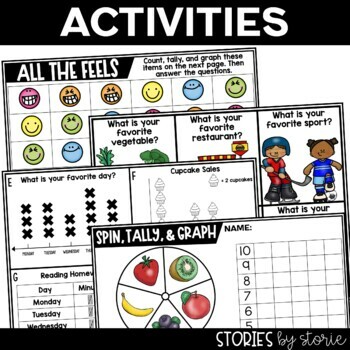 An anchor chart has been included with the steps for this activity. Students count and tally the objects on the picture page. Students graph the results and answer questions about the data. There are 9 versions and answer keys are included. Students will either read and answer questions or use the data provided to create a graph. 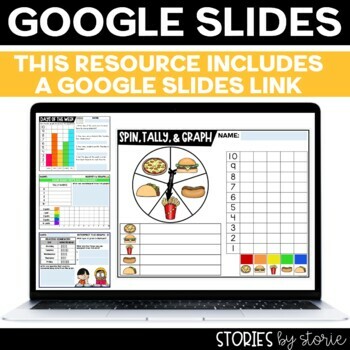 Students will practice with bar graphs, pictographs, line graphs, line plots, and circle graphs. There are 14 worksheets, a booklet cover, and the answer keys are included. Students choose a graph and complete a recording sheet where they interpret the data. There are 16 graphs included (4 per page). If you have any questions, please contact me. Thank you.